So Monday I know.. sorry. Not planned. But I have to tell you all.. Wow. Simply WOW! Blown away by your love AND by your pain! who knew so many of are suffering from so many different things. Makes me even more grateful for my good days you know? Thank you all for your wonderful words of encouragement. I don't usually write such personal things.. well I say that but lately I seem to be doing it a lot more! lol.. but honestly I hate talking about my health because I feel like I am complaining. I was So afraid it would come off that way and your comments and love.. helped me realize there was a reason I felt prompted to write that post. I was actually laying on my heater with the blanket pulled over my head and I kept thinking.. "I should be writing about this. It will be helpful for me later." So thank you for letting me share. So today ONLY Fun things! promise!! Tomorrow I am doing an ART Tutorial video.. just a fun video on how to use stencils and masks! So make sure to come back for that.. BUT today I had to come on and share with you a few things! It was live at 3:00 PM ESt.. but you can still here listen to it! Pat is So fun and I was so honored to be a guest on the show today! She also had several other fabulous guest.. so make sure to check it out! I had to share with you my NEW FAVORITE store.. that JUST opened! Even my new logo for my art is all using digial designs! There are SO many things you can do with digital downloads! I also use them to add to my art once I am done! I Scan it in OR take a picture and then I use it to enhance or add to an art piece I have already done. For isntance.. here is one I did.. I added the butterflies (one by the cage and one by the words). I also added the lace on the lefthand side. I added the digital designs in the upper left hand corner, as well as the scallop doily under the wood the bird is sitting on. I also added some really faint "book text" images on the right side of the canvas as well as the turquoise circle/Doily looking thing. it's AMAZING what digital artwork can do! Of course it's not on the original canvas.. BUT if I wanted to turn this canvas into a print.. or use it just on the web.. the new additions were fast and easy and looks like it is part of the original! Kinda fun huh? It's a total "hybrid" piece! So I am SUPER excited about their new digital art website! SO many awesome things on there.. online classes, free tutorials and free downloads.. YOU HAVE to check it out! and spread the word! They just launched the website last week! Here is a little more about it! Digital Dandelions brings together the digital and paper scrapbooking worlds by offering a variety of products and resources from digital kits to hybrid print-ables. Online classes will be added in the near future if you want to learn how to digital scrapbook, or if you are looking for some technique classes, such as journaling and hybrid projects or scrapbooking. Our talented designers have planted creative seeds to help you create beautiful art and lasting memories..
their new website is having a HUGE grand opening and offering all sorts of cool specials! Right now it's 25% off everything in the store plus a free Kit called "take flight" when you spend $10.00 or more! seriously .. um amazing! So go check it out! I can't wait for the online classes.. because I know there is SO much more I could be doing in the hybrid sense! Can't wait for those! did you know that the NEXT She Art Workshop Starts MONDAY???? Can you believe it? If you haven't signed up yet.. or on are the fence.. seriously! DO IT! come join me! You can still sign up! You get to enter the classroom monday morning and have FULL instant access to all of the 3 weeks! Plus join the other students from our first class which launched february 28th! Over a 1000 Artful women in ONE place! You are going to LOVE it! I have to tell you something that totally touched my heart recently about this class... Last week I received a few emails from women, telling me they had already taken the class and wanted to purchase an extra spot in this class.. as a way of "Paying it foward" for someone else. They said that this class had helped them so much in exploring their inner artist.. and showing them they could be creative.. that they wanted to pay it forward to someone else. I was In TEARS. I was so humbled and touched. One lady in particular.. a very special lady.. purchased 10 spots! 10 SPOTS INTO THE Class! To give anonymously to 10 women who had touched her life. She has cancer and is currently going through chemo right now and these woman had made a huge difference in helping her get through it.. I was so completely touched by her generosity.. so I decided I wanted to jump on the band wagon and PAY IT FORWARD too. You beautiful women (and men) who read my blog.. have all been so kind and supportive and encouraging to ME.. so I want to not only match what she did.. but I will double it! On this blog post today.. I will give away 20 spots into the She Art Workshop that start Monday! If you are already taking the class, then you can give it to a friend or family member and pay it forward to them! all you have to do is post on today's blog.. (spread the word too!!) and Monday morning, I will randomly pick 20 people to pay it forward to.. and I just wanted to say... Teresa.. you are my HERO! love you girl. You are one in a million. Truly. So that is my fun random things to share today.. help me pay it forward! If you know someone who didn't take this class the first time around.. or someone who needs it! Tell them to come post on the blog and get entered to win!!! Speaking of winners.. We have a few from some previous posts! Email ladies so I can get you ifo on both giveaways..
don't forget to post below.. Help me PAY IT FORWARD to you wonderful people.. who support and love me. THANK YOU! See you tommorow afternoon.. fun video tutorial on texture and stencils!!! wahoo! WOW! What a way to pay it forward! Such a touching story....I would love to win a spot! That is an amazing gift that that gal did, to purchase all those spots and Pay it Forward. It is so great to know that there are still so many wonderful amazing women out there that want to give back. Thank you!! Its people like you that inspire me even more. I love to do for others and that is one thing I've been trying to teach my children. Christy, for you to give away 20 spots is also amazing. Thank you. I will hope to win one of those:) Thanks much. This is great! A sure way to brighten someone's day! Wow--love the class concept & the pay forward generous spirit!! Would love to win a spot for my daughter's birthday surprise!! Thank you for your enthusiasm & sharing your talents with others--very empowering! Am absolutely excited to take the class and thinks it is fun and very creative. Hope to win and thanks for your generosity and inspiration! Thanks for always picking us up and giving us a reason to be HAPPY. Wow! this is pretty awesome. I took this class already, but I think it will be perfect for my sister. Thanks for the chance. 2 of my friends have taken this class and they LOVED it. Their artwork has been just amazing! I hope I get chosen - but even if I don't, I'm going to sign up and take it this go-round! Thanks! Wow! 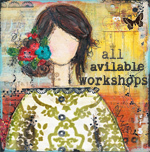 Would LOVE to join you and take the She Art Workshop!! Thank you so much for your generosity and the chance to win! Wow!!! How inspiring! I would love to win this. I want to take this class so much. Have thought about it everyday since the last launch. Paying it forward is so important in life. Thank you for reminding us. If I win, I will gift a spot in the class to my friend who is going through a tough time. She, like me...could use some "She Art"
Wow you are really generous! I try. Thank you! It is probably too late but I would love to be able to take this class. I have fiber just like you as well as lupus and degenerative disk disease in 3disks. I have recently had to file for disability. I just started scrapping and doing mixed media lately. I had no idea how therapeutic creating can be. For a little while I forget about the pain. Do to me having to stay at home and med bills I can not take the class but I hope to at some point. Your work is such an inspiration to me. I am saddened to hear of your struggles with fiber. Very gentle hugs to you. Wow! How generous of the BOTH of you! What a blessing it would be to take this class!! I've got my fingers crossed!! Thank you BOTH SOOO much! This is such a wonderful thing to be doing. I have just recently found your blog and the She Art class looks fabulous!